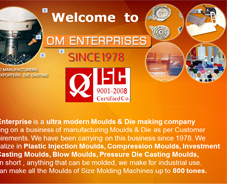 Om Enterprises established in the year of 1978 as a design, manufacturer and exporter firm dealing in various moulds for Automobile Components Moulds, Moulds for Lighting Components, Moulds for Refrigerator Components, Refrigerator Clear Components Moulds, Home Appliances Mould Samples, Casting Moulds' Components, Moulds for General Components and die casting components and Die Casting Components like Pressure Die Casting Components and Bakelite and CNC Milling etc. We also undertake the projects of CNC milling, Wire Cut, CNC Lathe (Turning Job) With our profound experience, we have earned an enviable position in domestic as well as international arena. Our products are widely used in different industries which include engineering, oil & paint, refrigerator, lighting, and so on. Known for their preciseness and finest quality, our products are offered in customized options, as per the definite requirements of our clients. The manufacturing unit is fully equipped with different machines, which work continuously to meet the deadline of orders. Every product is tested as per the ISO 9001:2008 standards to ensure its elevated performance and quality. We also provide installation training to our clients. With our products and services, we have acquired an immense client base, spread all around the globe. As a part of our endeavors to fulfill this aim, we have developed a comprehensive range of impeccable products. We strive to attain satisfaction of our clients. So, we are efficaciously equipped with all the necessary facilities that are vital to offer the customization service. 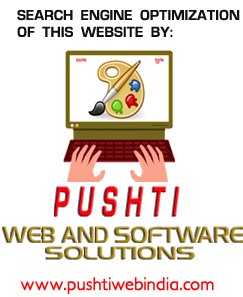 We design and develop our products as per the specifications of our clients. The tailored products are offered with the assurance of genuine quality and performance. Customized packaging is also offered as a part of our customization service. We can package the consignments, on basis of our clients’ guidelines. 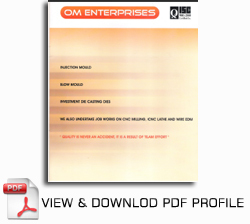 In addition to these beneficial services, we also provide after sales support to our clients. In this, we provide efficient installation training which covers different aspects of installation of our products at client’s site. •Spark erosion Machines- Joemars , Make- Taiwan with orbit cut. 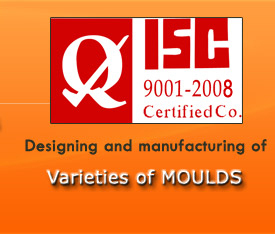 We design Moulds in our in-house design unit which is equipped with the latest CAD/CAM software. Additionally, we possess required facilities and technology to conduct Mould Flow Analysis as required. Each team works towards sole aim of understanding clients’ requirements and providing them with best possible customized product. For a very long time, our workforce has been the highlight of our company in domestic as well as global arena. In our business procedures, we follow a quality conscious & realistic approach. With the assistance of this approach, we have acquired the ISO 9001:2008 certification. This certification proves the impeccability of our products and services. The quality checking workshop is versed with an able workforce and different testing machines. Our ISO quality certification has earned us an enviable position among our competitors. The congenial atmosphere of our warehouse ensures high level of protection from hazardous effects of atmospheric alterations like corrosion, particularly. •Global India / Orbit India.